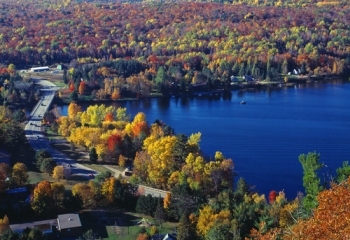 The Township of Lake of Bays is situated two and a half hours North of Toronto, with Bracebridge just to the South and Huntsville to the West. This exquisite area is home to the second largest lake in Muskoka with over 170km of pristine shoreline. Here cottage country is at its finest; many choose this location to vacation and live in as this is one of the cleanest lakes in Muskoka due to its location at the top of the eco-system, with close proximity to the protected natural wilderness of Algonquin Park. Lake of Bays cottages are found in a variety of communities that surround the lake, including Baysville, Bigwin Island, Dorset and Dwight. Each community has a quaint combination of general stores, cafes, restaurants, shops and access to Lake of Bays. Start your search for Lake of Bays homes and cottages for sale now on the MLS® below or read more about Lake of Bays. Customize your search for cottages in Lake of Bays! Register with Relaxed Living Realty and you'll be able to input your specific real estate preferences. Each community has a different offering of real estate on Lake of Bays. The community of Baysville is situated on the water and also includes some smaller lakes in the area which represent good value for cottage buyers. This area has a wide range of pricing and waterfront property in the area with picturesque views. Lake of Bays real estate surrounding Dwight and Dorset are good options as well. Dwight offers prime waterfront property in the area starting in the high $900s. Country cottage living has never been better on Lake of Bays. With the collection of charming communities and delightful amenities, this is a fantastic place to spend your summers, or the rest of your life. Bigwin Island is home to a renowned private golf course, Bigwin Island Golf Club, and with breathtaking dining facilities, this championship golf course is truly world class. Stop by the Farmers Market in Baysville in the summer and visit the library which offers activities for children, or visit the ice cream shop for a cool treat. Nature lovers will be interested to know that the village of Dwight is only 20km away from Algonquin Provincial Park. The annual Firefest event on Dwight Beach in July is a cottage tradition. Are you considering real estate in Lake of Bays? Contact Relaxed Living Realty, experts on real estate in the area. They’re happy to answer all of your questions or provide you with more information.